The newly renovated Holiday Inn Rock Island-Quad Cities with superior amenities and outstanding service await you. Not all travelers are alike, so our 172 guest rooms and meeting space are designed to meet the needs of business and leisure travelers. 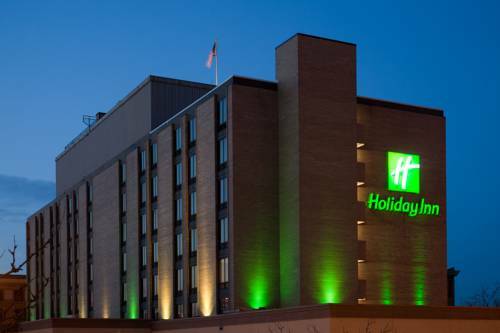 The Holiday Inn Rock Island-Quad Cities is The Place to Meet with over 10,000 square feet of flexible meeting and banquet space. Whether you are planning a corporate event, an intimate cocktail party or a celebratory banquet you will have our undivided attention. We are located downtown in The Rock Island Arts and Entertainment District off I-280 / IL Highway 92 and minutes away from the Quad City International Airport. We are a short drive from the Rock Island Arsenal, Modern Woodmen, Deere and Company, Royal Neighbors, MidAmerican Energy, UnityPoint Health-Trinity, Augustana College, Circa 21 Dinner Playhouse and iWireless Center. As part of The District we are home to the Gumbo Ya Ya and Ya Maka My Weekend festivals and the Rock Island Grand Prix. Annual events located near our hotel are: the Quad City Air Show, Quad City Times Bix 7 marathon, the Quad City Hitmen baseball diamonds and the John Deere Classic. The Quad Cities is home to the Quad City River Bandits and Modern Woodmen Park, Quad City Mallards hockey, Quad Cities Criterium bike races and the Quad Cities Marathon. Our flexible conference space can be divided into sections, or open to an elegant ballroom. This room has standard florescent lighting and chandeliers. The Moline WalMart is a superstore featuring Subway with a pharmacy, photo center with 1-hour photo service, portrait studio, vision center, and full grocery department. Open 24 hours 7 days a week excluding Christmas Day. The Moline Target features: Starbucks and a fresh grocery department. Includes a pharmacy. Store hours are: Mon. -Sat. 8:00 am - 10:00 pm and Sun. 8:00 am - 9:00 pm. Saukie is a stunning example of a golf course designed from the early part of the 20th century. This public course is considered to be an executive length" course and is a classic example of a short course that will challenge every golfer. Located right next to the Pavilion, the John Deere Store has just about everything for all fans, young and old. Clothing, toys, collectibles, videos, books ... you name it, chances are we have it. ~55 miles from Rock Island. ~73 miles from Rock Island.